» home » enterprise zones » » is your die-change process all that? Is Your Die-Change Process All That? If your pressroom is cluttered, poorly laid out, or lacks a good die-transport system, then achieving quick die changes (QDC) is going to be, at the very least, difficult. MetalForming spoke with Lee Ellard, national sales manager for Stamtec, Inc., Manchester, TN, to learn the most common pressroom mistakes and what to do about them in order to achieve QDC. Shown are eight (yellow) traveling clamps. Each clamp is attached to a drive chain for extending the die clamp into and out of the die area, making it safer and easier for a die-setter to set the clamp in its clamping location. “The most common inefficiency would be poor staging and layout,” says Ellard. “All pressrooms must have a staging area for dies, tools and coils for when it’s time to make a die change.” Ellard recommends locating staging areas close to the presses, and prestaging items in those areas well in advance of the last hit of the current die or coil. A standard rod-type clamp, when manually slid into the T-slot of the bolster (upper right) and placed in the clamping position, helps to achieve quick die changes. When evaluating the pressroom for quick die change, ask if the dies are standardized for clamping and fitting, says Ellard. He suggests a standardized clamping height for the dies. “Better yet, mount all dies on subplates standardized for clamping height and left-to-right and front-to-back dimensions,” he says. 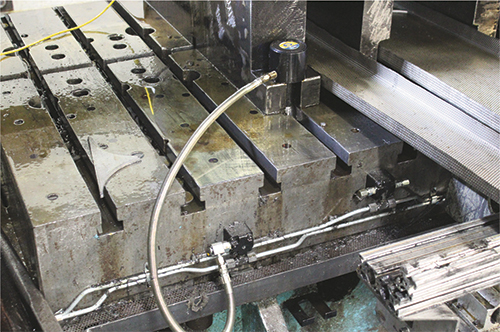 Standardization will allow use of the same-size clamping fixture for all dies, and with standardized subplates, fixed die-locating pins can be used in the press bed for quick, accurate location of the die on the press bed. This makes for easier, possibly automatic, placing of clamps. Having addressed staging and layout, storage, retrieval and transport, and standardization of dies, select quick die-change hardware. This includes control boxes, hydraulic power units, die lifters, bolster extensions, transport (forklifts, mobile die carts and rail-mounted die carts), die tables and rolling bolsters, and die-storage racks and hydraulic clamps, with ledge and rod clamps being the most common.